Mattress appeal: Lismore Bishop Gregory Homeming (centre) with David Martin, from Instyle Sleep Centre (left), and Lismore Mayor Isaac Smith promoting a mattress drive for flood-affected residents of the Northern Rivers. 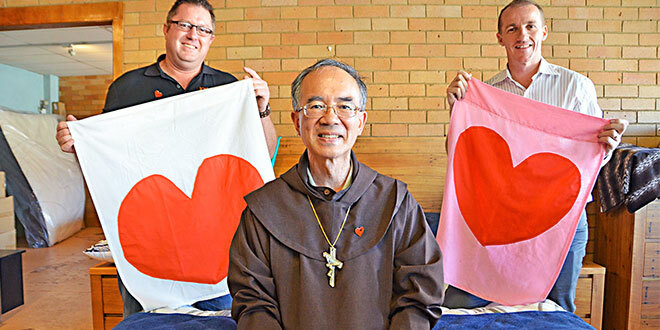 DONORS from all over Australia are helping Lismore diocese provide more than 900 mattresses to people devastated by floods in the Lismore and Tweed districts at the end of March. Lismore Bishop Gregory Homeming, new to the diocese, established an appeal to raise funds to buy a new mattress for all those who lost theirs in the flood. The appeal has raised more than $350,000, coming from donations by individuals and Catholic dioceses and entities from all over Australia. Lismore diocese will fund the residual cost of the program, estimated to be about $80,000. The diocese has received requests for more than 900 mattresses. About 820 have been delivered and the rest are on order or in storage. All mattresses have been bought and distributed by local businesses. “After seeing so many people losing their homes, their livelihoods, we wanted to ensure that those impacted by the floods at the very least had something to sleep on,” Bishop Homeming said. “People have been incredibly generous and we thank both the Catholic communities around Australia as well as our local community. “Difficult times bring out the best in people and this appeal has been a united effort. Donations can still be made at the website www.dioceseoflismorefloodappeal.org. Requests for new mattresses will be accepted up to May 31.